Electronic cigarettes may still be new and not a lot of people have tried it yet but this new technology is taking the world by storm. Cigarette smoking has a very long history as it goes back to the ages but it’s only until the middle of the 20th century when it was greatly advertised. During those days, cigarette smoking was wrongly advertised to be good for your health and people were convinced to start smoking only later on to find out that it actually contains a lot of harmful chemicals that can cause cancer. After tests and research have shown the health effects of smoking did the world become aware of the many dangers of smoking but many people still want to continue doing it. Nicotine is a highly addictive substance and it’s what makes cigarettes so addictive. Nicotine in itself is not considered as a carcinogen which is why there are different cessation methods that helps smokers get the nicotine they need but without the harmful effects of the other chemicals. Electronic cigarette is a great way to get all the fun of smoking, together with the nicotine, but without all the harmful chemicals and awful odor. It is a device that uses electricity, atomizer and cartridge to turn the e-liquid containing nicotine and flavors into vapor which you inhale in and puff out. You feel like you’re actually just smoking a traditional cigarette and you can slowly reduce the concentration of the nicotine if you want to finally kick the habit. FEMA and FDA approved ingredients for their e-cigarette cartomizers so even though there are no FDA approved electronic liquids yet, you know the ingredients in Halo’s cartomizers are. Great value for your money. Not many choices are available. G6 Starter Kits and Triton Starter Kits are available but the types are only different in terms of their color. It is similar to the size of the traditional cigarettes. It is priced for just $44.99. 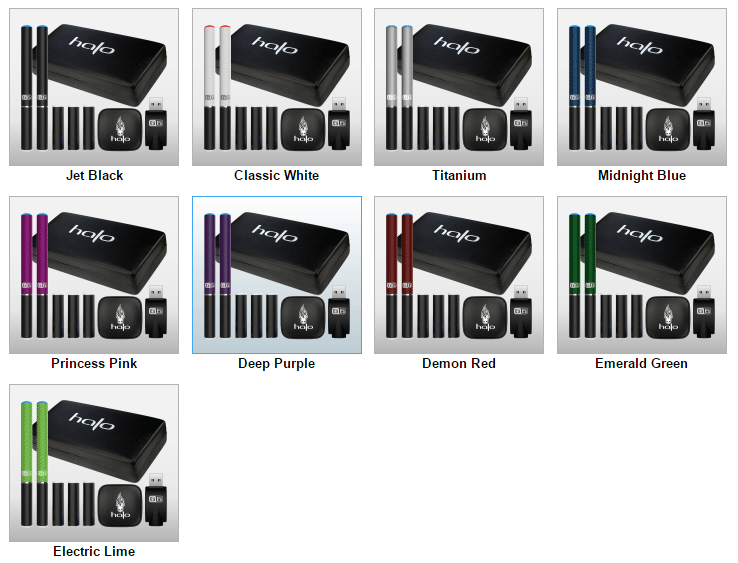 You can choose from the different colors available: Jet Black, Demon Red, Midnight Blue, Emerald Green, Classic White, Electric Lime, Deep Purple, Titanium and Princess Pink. The G6 replacement batteries, should you need them will cost $12.99 each for either the 65mm mini or the 78mm standard. They have an extra-large version at a whopping 102mm in length for just $1.00 more ($13.99). If you want a more superior system then it’s time to move on to the Triton starter kits. Priced at $64.99 per kit and comes in different colors as well. Colors available are: Jet Black, Yellow Jacket, Iridescence, Electric Lime, Deep Purple, Emerald Green, Titanium, Princess Pink, Midnight Blue, Mocha and Demon Red. The Triton battery comes in 4 sizes. 400 mAh – $15.99 – 480 puffs per charge – 57.5 mm. 650 mAh – $16.99 – 780 puffs per charge – 74.5 mm. 900 mAh – $17.99 – 1,000 puffs per charge – 89.8 mm. 1,300 mAh – $19.99 – 1,350 puffs per charge – 99.6 mm. The lifespan of these batteries is 300 power cycles. Be sure to not mix the charger of the G6 with this battery because it could cause irreversible damage to your battery. 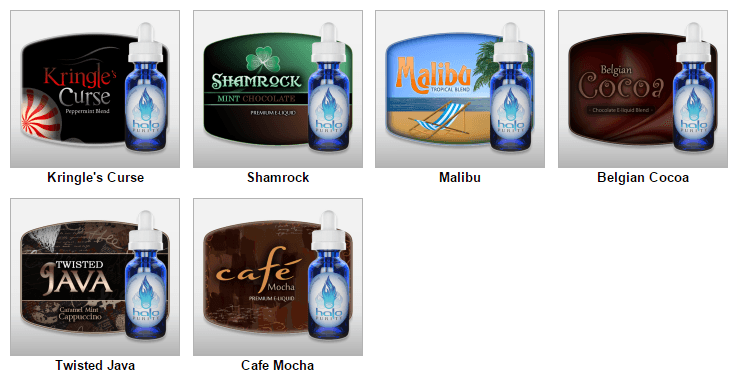 Halo e-cigarettes e-liquids come in 3 categories of flavors: Tobacco, Menthol and Gourmet Flavors. 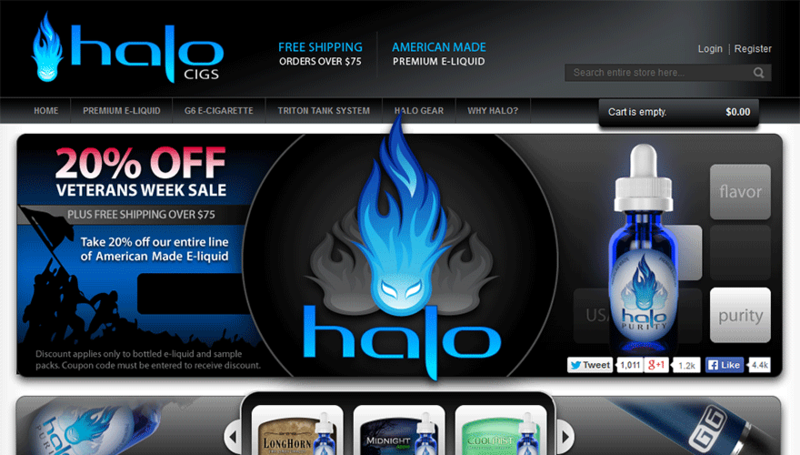 Part of the fun with ecigs is trying flavors and Halo delivers many options for you. 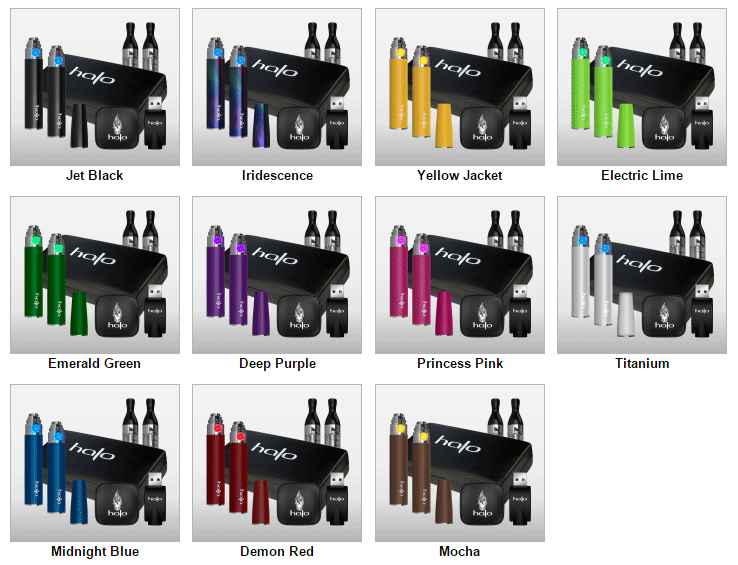 Halo Ecigs currently offers 12 different flavors for you to choose from in the Tobacco category. 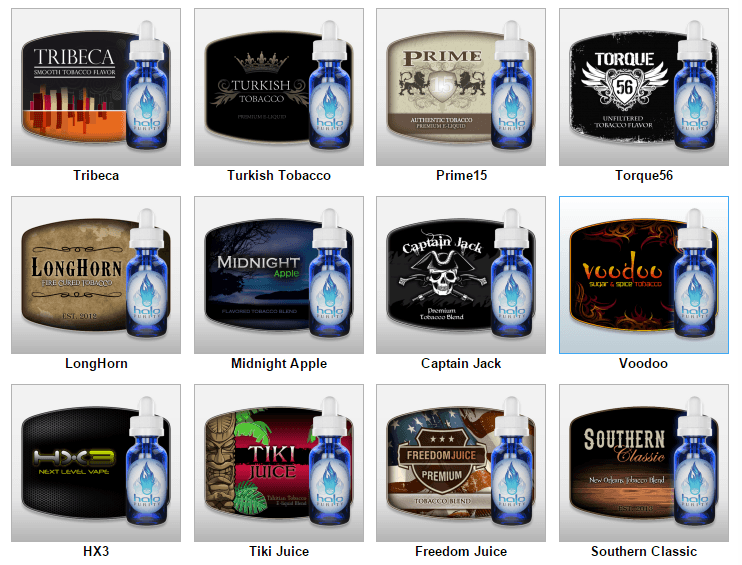 As shown in the image above, they are Tribeca, Turkish, Prime15, Torque56, Longhorn, Midnight Apple, Captain Jack, Voodoo, HX3, Tiki Juice, Freedom Juice and Southern Classic. 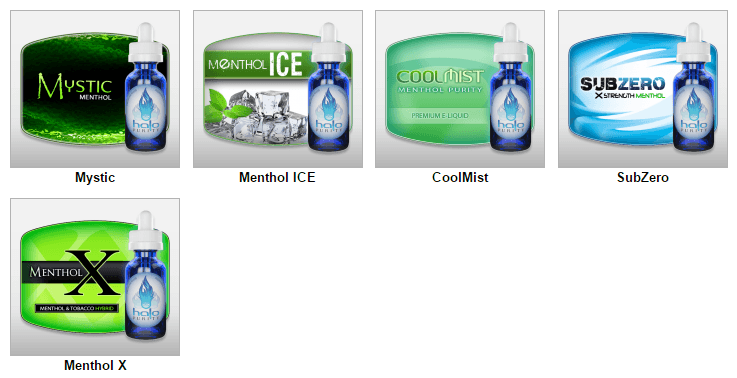 With the menthol option, you’ll have 5 flavors to choose from including Mystic, Menthol ICE, CoolMist, SubZero and Menthol X (their newest flavor). Finally, the last category of flavors is the gourmet section which offers 6 flavors including Kringle’s Curse, Shamrock, Malibu, Belgian Cocoa, Twisted Java and Cafe Mocha. Halo’s Customer Support is available during business hours Mondays to Fridays from 9AM to 11PM EST. You can contact them through chat or you can email them for their premium support. They currently have 3 FAQ sections that will answer the more common questions such as ingredients, how to use the batteries, how to refill and more. At TopFiveAdvisor, we’d like to see an enhanced support section that includes video demonstrations. An all-text FAQ section will not show the newer-to-ecigs customer the exact process on how to use their systems. Halo e-cigarette is a great buy. If you want to get your money’s worth and want to enjoy your experience with an e-cigarette then this is the brand to buy. This e-cigarette stands out especially on the aesthetics side but that doesn’t mean that’s all it can brag about. It’s such a pleasure to use and you’ll get the nicotine amount that can satisfy your cravings. The only downside though is that there’s no nicotine-free e-liquid available.